Dr. Rick Warren is passionate about attacking what he calls the five “Global Goliaths” – spiritual emptiness, egocentric leadership, extreme poverty, pandemic disease, and illiteracy/poor education. His goal is a second Reformation by restoring responsibility in people, credibility in churches, and civility in culture. Rick Warren is a pastor, global strategist, theologian, and philanthropist. 1. God’s presence. Rick knows God as a personal and close friend and not some distant deity. 2. A history of watching God at work. Rick has seen miracles before, and he knows he’ll see them again. 3. The promises of God in the Bible. For years Rick has written songs based on the promises of God. Now they come back to him and strengthen his faith. 4. Worship. He’s learned that if you’re going through a tough time, you need more worship in your life. 5. Church. He has leaned on his church family for support. 6. The goodness of God’s plan. Rick claims the promise of Romans 8:28: “We know that in all things God works for good with those who love him, those whom he has called according to his purpose” (GNT). You have to know God’s Word if you want to hear his voice and transform your life. That’s why we want to send you the Verses for Hearing the Voice of God Scripture Box to help make memorizing God’s Word a real joy for you. 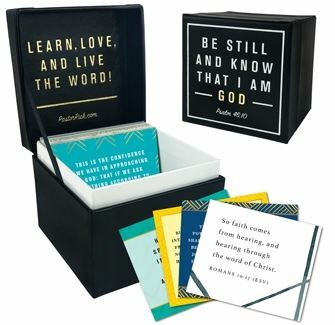 This brand new Scripture Box is constructed with a soft black leather-like material and it comes with a freshly created set of 52 full-color, beautifully designed Bible verse cards based on Pastor Rick’s teaching series, Hearing the Voice of God. When you understand how to hear God’s voice you’ll be better able to . . . The NEW Verses for Hearing the Voice of God Scripture Box is our 1-week only offer to thank you for your gift below to help share the hope of Jesus with more people. Supplies are limited, so act now! Request yours when you give below.